We finally have our first snowfall (measurable one) of the season and it is absolutely beautiful outside. Our abode is in a wooded area and the branches on the trees are just glistening. I love, love, love the first snowfall of the year!! The time between the splendor of the autumn colors and the first snowfall is long...very long...and so blah! Many life changes have occurred in our family the past four months. My mom passed away the end of September after a long journey with Alzheimer's. We were fortunate in that we were able to keep her at home with us the entire time. She was such a lovely lady and we were so blessed to have her touch our lives. The first Christmas was empty without her presence. We lost our dog and faithful companion just two weeks before Christmas. So we are adjusting to our new "normal". Life goes on and I keep reminding myself of all that we have to be thankful for. That being said, it's been rather lonely at times. Christmas decorations are down and as much as I love the trees (we had three big ones and four little ones for each grandchild), it is nice to see the open space and freshness as we begin to welcome a new season. Just three months until spring weather!!! I haven't decided whether I will go back to work or not. Thought I would see how the winter does and then decide. There are many, many projects that I've put off for a while. First one we are tacking is a redo of the guest bathroom. Installer is coming this afternoon to measure. New counter top is sitting in the bedroom floor. This weekend will be spent removing border (yes, it's been there for a while) and sanding walls from the texture paint that was applied when the house was built. (We bought this house six years ago and just moved in four years ago. Mom was with us so we did the minimum updates to keep things as calm as possible.) Have the paint color picked out - now do I paint before or after the floor is installed? What is your opinion? I see pros and cons to both. This post is all over the place so bear with me. I need one of those shirts this morning that says "I'm talking and I can't shut up!". I was watching the Today show this morning and saw Kathie Lee Gifford do the hula-hoop for what I thought was a long time. Do you remember the days when we did that for hours as kids? Well, I happen to have one in the garage so I ran out and tried it - couldn't even begin to make it happen!! When was the last time you tried it? Can you still do it? I've lived in two homes my entire married life(s) (I'm 39 and holding!) and just noticed that coming down the stairs this morning, there are 13 stairs. The same number of stairs that was in my home in Illinois. I've always considered 13 to be my lucky number, but the same number of stairs in each home just dawned on me this morning. I'm wondering - is that a standard number or just a fluke? Do you have stairs? How many? I didn't do New Year's Resolutions this year - I've compiled Projects for the New Year! Mine include the bathroom redo, painting two bedrooms, and if I can talk the honey into it, redoing our master bathroom. Scanning the scads of pictures I have in the closet, scanning/sorting the boxes of 35 mm slides that belonged to my parents, viewing the old VHS tapes and putting onto DVD's. Oh yes, getting into shape. We have an "exercise room" that until yesterday was a dumping ground. It is now nice and clean and ready for use! My goal is to use the treadmill and lose about 20 pounds. Anyone care to go on this journey with me? For so long, my care-giving duties provided an excuse not to tackle this goal...now it's just me and the mirror! And most importantly, I want to become more active in blogging, getting more followers and developing my blog into one that everyone enjoys reading. Any suggestions are welcome. I feel like I'm taking a long breath and starting all over again. Hoping you are having a wonderful day!!! 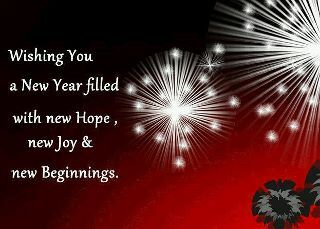 And may your New Year be filled with love, laughter and memories to last a lifetime! !